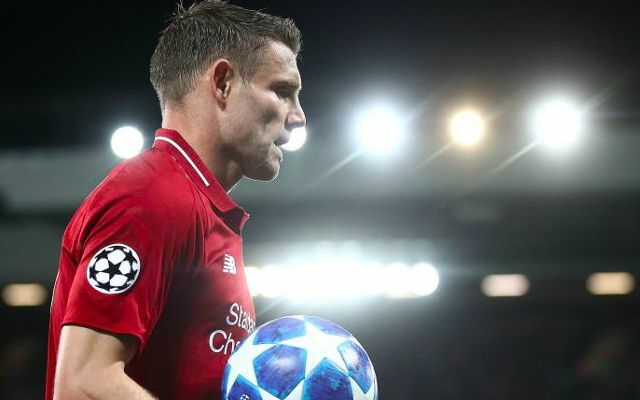 James Milner is evidently in contention to face Huddersfield Town on Saturday after returning to training with Liverpool. The midfielder’s involvement at Melwood arrives just two weeks after he was forced off in the first half of the goalless draw with Manchester City with a hamstring problem. His availability has been the product of a remarkable turnaround from an injury that had initially been tipped to sideline him for up to a month. It also serves as a glaring reminder of his incredible durability at the age of 32 having played a prominent role for the Reds over the past 12 months. Milner’s swift recovery has been made all the more valuable in light of Naby Keita’s hamstring injury, which is set to see him sidelined for at least two weeks. The Guinean returned to Melwood for treatment this week after hobbling off during his nation’s 1-1 draw with Rwanda on Tuesday. Mohamed Salah and Virgil van Dijk were both meanwhile spotted back in training on Thursday following their respective injuries during the international break. Salah was substituted late in Egypt’s 4-1 win over Swaziland with a muscle strain, before Van Dijk withdrew from the Netherlands squad after Saturdays’ 3-0 win over Germany due to further discomfort in his rib. The pair are now fit to play at the John Smith’s Stadium, although it will be interesting to see whether Jurgen Klopp opts to preserve the legs of Salah following his fatigued display against City. There was no sign of Sadio Mane at the Reds’ training facility, with the Senegal forward having undergone surgery on a broken thumb suffered whilst away with his national team. To have Milner back is a monumental boost ahead of what beckons as a tough winter period.